Considering the size of Texas, it’s possible for people to visit the state and barely scratch the surface of all it has to offer. Spanning thousands of miles, various cities and unique cultures provide guests an opportunity to have a different experience each and every time they visit. The grand scale can make it difficult to pick a single destination or point of interest, and with so many famous landmarks in Texas, it is virtually impossible to see them all. However, past tourists have identified the cream of the crop, and a trip to the Lonestar State isn’t complete without a pit stop at at least one of our top ten favorites. 1. John F. Kennedy Memorial Plaza & Six Floor Museum: It’s hard to think about Dallas without thinking about late President John F. Kennedy. And, as a result, there are many Dallas Attractions associated with the late world leader. One of the most visited and perhaps most important of all Texas landmarks, is a rather unimpressive looking structure that was originally designed and constructed to offer people a place to reflect and remember the former leader of the free world. Roofless and framed in pre-cast concrete, the design is reminiscent of an open tomb, allowing light to trickle in and a floating appearance to the structure. The Six Floor Museum at the Dealy Plaza that once housed a school book depository was created to honor the life, death and legacy left by the President JFK. Visitors are introduced to historical filmography, audio records, photographs and memorabilia commemorated to the events leading to the tragic assassination and offers multiple theories as to what truly happened on that day. 2. Congress Avenue Bridge: Austin Texas, the capital of the state, is known for many things – historic buildings like the Littlefield, fine dining and top notch local cuisine and, of course, live music. However, there is another thing that the southern music Mecca is known for, and some find it interesting while others find it downright disgusting. The simple truth is that one of the most unusual of all Texas landmarks can be found right amidst the hustle and bustle of downtown Austin. Each year from March to April, this busy bridge plays home to up to one and a half million bats, mostly all of the female variety. They come each year to give birth, and their migration causes the migration of loads of tourists, ready to check out the largest urban bat colony in the country. 3. Alamo Mission: There is little dispute that one of the most well known and famous of all Texas landmarks is the little white chapel that is also called the “Shrine of Texas Liberty.” It’s here that the mission turned compound in the nineteenth century, when it served as a prison and a hospital. The small building has gone through heavy restoration to restore it to a representation of its former glory, and it draws many visitors interesting in the structure’s tumultuous history and rich heritage concerning the state. 4. 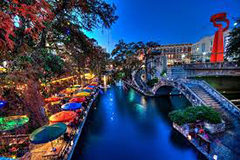 San Antonio Riverwalk: Located virtually beneath the roadways of San Antonio, this major tourist attraction consists of winding pedestrian paths that weave over and aside the San Antonio River. The area is packed with restaurants and shops and guests can enjoy a walk along the water’s edge or even a boat ride. The Riverwalk is quickly becoming one of the most popular of all Texas landmarks with tourists, who find it a unique and relaxing way to explore the urban culture of the city as well as have an opportunity to take in the natural beauty that surrounds them. 5. Natural Bridge Caverns: Discovered by college students in the 1960’s, these caverns found just outside of San Antonio are the largest commercial caves in the state. Here, cool and vast caves made of limestone await visitors anxious to see the underground river that winds beneath while they explore hidden passages and crannies that branch off from the main rooms. There are many tour options available to travelers who have come to see the largest of the underground Texas landmarks, and for those seeking some above ground adventure, zip lining is available just above the surface. 6. Houston Space Center: When people watch space shuttles take off, they can’t help but wait for the iconic call to Houston. And, while the Space Center is no doubt one of the most popular of all Houston tourist attractions for this reason, most guests likely aren’t aware of just all there is do here. Perhaps a living in space simulation sounds appealing, or having lunch with an astronaut? It’s all possible at this techy topper amongst Texas landmarks. Tour the campus on a tram or sign up for a Level 9 tour, whatever tickles your fancy be it checking out historical space suits or catching a sci-fi flick, the Space Center is sure to pack all day fun. 7. Sam Houston Statue: They say that everything is bigger in Texas, and that is incredibly evident when standing at the base of the statue named for the city’s famed politician. The world’s tallest American hero homage at 67 feet in height really draws a crowd even for those who don’t know much about the man the monument is named for. However, this statue is one of the most iconic of all Texas landmarks and draws thousands of guests thanks to both his contributions to the populus city’s history and his rather large mark on the side of the road. 8. Galveston Island: Texas may be known for its dusty flatland, and when many people think of its long coast, thoughts of cruises out of Galveston may come to mind. However, the shoreline here is worth a much longer glance than those afforded guests hopping aboard a mega cruiser. It’s a historic place and unique amongst Texas landmarks, offering visitors warm waters, pristine beaches and a wealth of activity and accommodation options. Texas is an incredibly large state, and it’s not fully explored until a trip down towards the tip. 9. South Padre Island: Thirty four miles of uninterrupted beach front are the highlight of this almost tropical Texas locale. This island filled to the brim with typical tourist attractions, lodging, activities like water sports and a wealth of dining opportunities. However, it’s not the sun kissed beaches that make Padre one of the most interesting Texas landmarks. The island tips off the longest barrier island chain in the world, and holds the distinction of being dubbed the sand castle capital of the world, as well as the cutely named fireworks capital of Texas. 10. Cadillac Ranch: Route 66 is iconic in and of itself, reminiscent of a different time when road trips were an adventure in themselves, regardless of the destination. And it’s here, along this well traveled stretch of highway, that the artistic remnants of San Francisco hippies can be found. Sticking straight out of the coarse, desert ground are brightly painted celebratory pieces of automobile art, dedicated to the tailfin that the Cadillac was known for. Devised as a hip and shocking artistic piece to baffle both tourists and locals alike, the ranch might be one of the weirdest Texas landmarks, but it’s hard to argue its high ranking amongst roadside attractions.